Welcome your guests to your home with this personalised 'vintage Key' cross stitch sampler. 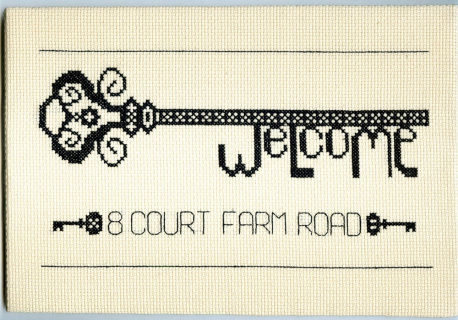 Welcome your guests to your home with this personalised cross stitch sampler. This kit makes a fantastic traditional gift either completed or in the kit form. This fresh contemporary design inspired by the very beautiful traditional blackwork embroidery and is stitched on to a lovely light hessian cotton Aida. An alphabet and directions as to how to personalize with your address or house name.